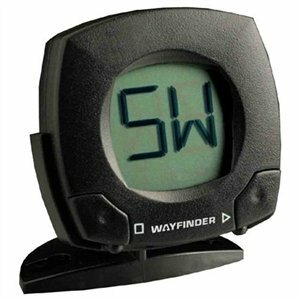 Unfortunately, the WayFinder V100 Digital Vehicle Compass is no longer available. You can explore other items in the Navigation & Compass category yourself to try and find the perfect replacement for you! The WayFinder V100 digital vehicle compass is an affordable navigational tool that provides unequal performance in any car, truck, RV, or SUV. The V100 boldly displays the direction traveled with eight cardinal points. Unlike traditional floating ball compasses, which require difficult manual adjustments, the V100 compass electronically compensates for the magnetic interference generated by a vehicle. Direction of travel shows instantly on a large LCD display, without any settling time.